Posted September 7, 2016 under Ask Us. Knee pain is common among runners. The medical term for “Runner’s Knee” is called Patellofemoral pain syndrome or PFPS and can affect one or both knees. Symptoms usually include pain and tenderness around the knee cap (patella). Some people may have pain around the back of the knee also and others may say they feel like their knee “is giving out” while they are running, jumping and/or while walking up and down stairs. 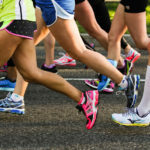 There can be many different causes of “Runner’s Knee” such as injury to a joint, fluid around the knee, muscle strain, a tear in a ligament (band of tissue that connects the bones), etc. If your knee pain doesn’t get better with rest, ice, over the counter pain medicine such as ibuprofen and avoiding the activities that bring it on, make an appointment with your health care provider. If you can’t put weight on your leg, you have redness, pain around your knee with a fever, call your health care provider right away or go to an emergency room and get checked out. Treatment may include: wearing a brace on your knee, having physical therapy, medicine, and less often, surgery.